There are bird feeders and then there are squirrel feeders disguised as bird feeders, a fact known well by those of us who have committed a part of our lives to our yard birds. I came to the art of bird feeding late, having spent my adult life in apartments that forbid the hanging of anything, even a cake of suet, from the fire escape. And, although I grew up in a house with a great yard, my parents were not of the bird-feeding persuasion. Finally, a few years ago, I gained a place to live with a tiny front yard and joined the wonderful world of tube feeders, platform feeders, suet feeders, pretty feeders, fragile feeders, plus the variety of seeds that go into these feeders–nyjer seed, black oil sunflower seed, peanuts, millet, and a zillion mixes. And, I learned that wherever you have bird feeders, you also have squirrels. Persistent, greedy, clever squirrels who will rob you and your birds of all seed. Determined not to be defeated by squirrels, I jumped at the opportunity to review a Squirrel Buster Wild Bird Feeder, produced by Brome Bird Care. The company offered 10,000 Birds a choice from its product line of six feeders, and for some reason, Corey told them to send me their Finch feeder. 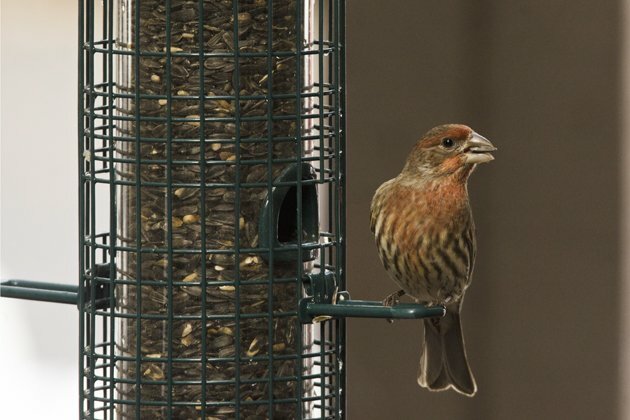 I thought this was an odd choice, since finches eat nyjer seed. And, nyjer seed is very low on squirrels list of seed favorites. In fact, I have never seen a squirrel eat nyjer seed, even when it has been spilled all over the yard. Once I received the Finch Feeder, however, I realized that I already had two other Brome Bird Care Squirrel Buster Wild Bird feeders: the Classic and the Mini. So, I can tell you about my experiences with all three products. The idea behind the Squirrel Buster feeders is that squirrels are heavier than birds. At least, feeder birds. 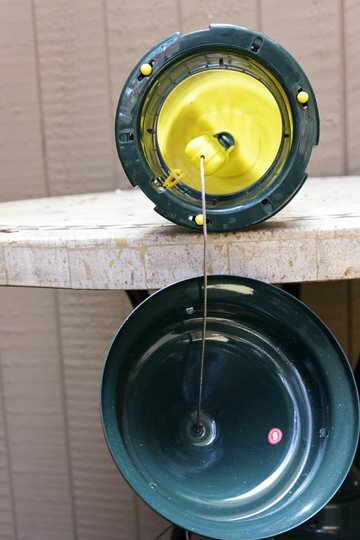 The feeders are designed in two basic parts—an inner plastic tube that holds the seed, and an outer wire “shroud.” When all is good, the openings in the wire shroud align with the seed port openings of the inner tube, and the birds can easily feed. But, when a squirrel dares to jump onto the feeder, clutching the wires of the shroud in its greedy claws, the shroud goes down, blocking off access to the seed ports. This really does work, and I have had many delightful moments watching squirrels leaping onto my Classic and Mini feeders and banging their faces against the shroud in frustration. Don’t worry; no squirrels have been harmed. They just try again and again and again, and eventually, as squirrels do, they find a way to eat the seed, which usually involves hanging from a nearby branch and sticking their mouth into the seed ports of the Classic feeder. The Squirrel Buster people know that this is a possibility, and they state in their brochure and on their website that the feeder needs to be hung with space above and around it. They specify at least 16-inches clearance, but I think you need a 2-feet minimum. This also prevents the squirrels from shaking the feeder to scatter feed onto the ground. And, when you are positioning the feeder, it’s important to remember that squirrels can swing from anything to access the seed ports, including nearby feeders. This is how my squirrels have done it—latch onto that neighboring suet feeder and swing! Squirrel access from the bottom isn’t a problem; this is where the weights come into play. A “negative grip tube” prevents the squirrel from grabbing onto the wire hanger on top of the feeder. Also, because the feeder grids are made of metal, squirrels cannot destroy them with their teeth, as they have gleefully done with a couple of my plastic feeders. 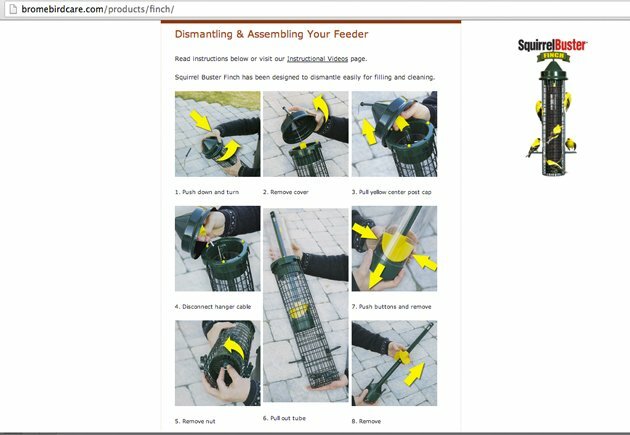 In addition to the squirrel-prevention construction, Squirrel Buster feeders are easy to use and clean. For both the Classic and Finch feeders, all you need to do to fill them is twist off the top and pour seed (that’s the Finch feeder with the top off in the photo on the right). The Mini feeder is a more complicated to open; you basically have to take the feeder apart. It only takes 30-seconds, but that is at times 30-seconds more in the freezing cold than I would like. This is my least favorite feeder of the group, partly for this reason. The Mini tube also tends to get clogged by larger seeds, so using it requires purchasing small seed mixes without sunflower seeds, which can be hard to find. Brome states that their seed tubes are constructed with a ventilation system, which “permits humidity and warm air to escape through waterproof vents at the top of the feeder” and keeps the seed fresher than other feeders. In three years of use, I have never found moldy seed in the Classic or Mini feeders, so the system appears to work. I dread cleaning my bird feeders, even though I know it is not healthy for your birds if you don’t do it. So, I approached cleaning my Squirrel Buster feeders with dread. The diagram on the brochure (also available on the Brome website) looked very complicated. Thankfully, in practice, taking the feeder apart and cleaning it was very easy. It was a relief not to have to dig into crevices with tiny brushes like I need to do with some of my other feeders. Then, of course, I was dreading putting the feeder back together—so many parts! But, that too was much easier in practice, and I only had to refer to the instructions once. 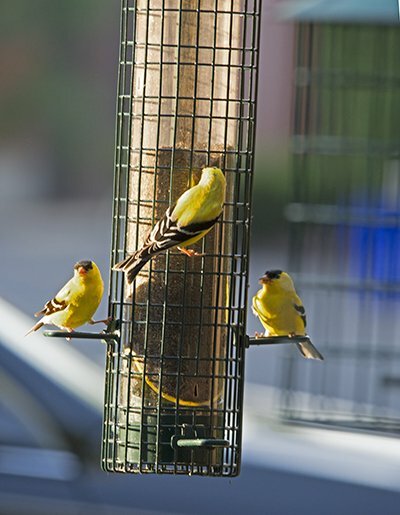 My goldfinches and future fall feeder birds can now enjoy fresh seed from clean feeders. Squirrels are not, as I wrote above, a problem when it come to nyjer seed. (If you have had squirrels attack your finch feeders and eat your nyjer seed, I’d like to hear about it.) Still, there are other excellent features that make the Wild Squirrel Finch feeder a very good option. First of all, it holds 1.4 quarts of seed. That is a lot of nyjer seed, and it means I need to fill it less than my other finch feeders. (Again, this is the northeast. It gets cold here.) Second, there is the ventilation system, which keeps the nyjer seed fresh, always a problem with this particular type of seed. Third, the goldfinches really like it! 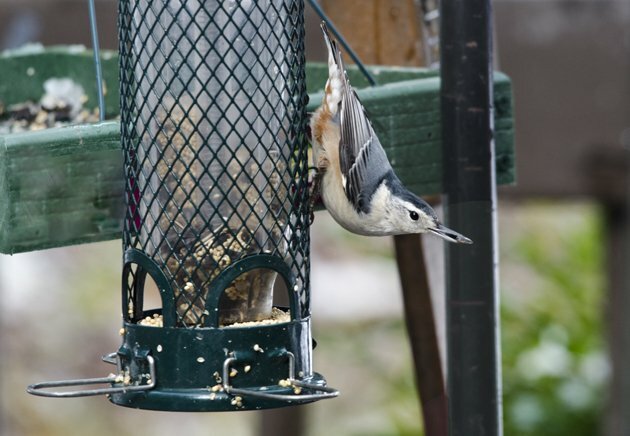 The feeder offers both four perches on the bottom area and grids for clinging while eating on its upper area. This allows as many as eight finches to feed at the same time, and also gives them the “real estate” in which to jockey for position, as finches tend to do with great noise and exuberance. Brome Bird Care offers six different models in their Squirrel Buster line; this review covers three of them. I’ve very much enjoyed using the Classic and Mini feeders for over three years and the Finch feeder for five months. Not only do they live up to their promise of making squirrels crazy by their weight system, the two larger models hold a lot of seed, and all models are easy to fill and clean. They also look nice. Bird poo is easily cleaned off with a damp paper towel, and the dark green casings blend in nicely with gardens and don’t distract from the birds if you like to photograph them as they eat. Squirrel Buster Wild Bird Feeders are expensive. The Classic and Finch feeders retail for $52.95 each, and the Mini retails for $25.95 (prices from Amazon, where you can purchase them at a slight discount). This is probably why I waited 3 years to invest in my Classic feeder. But, after losing cheaper feeders to squirrel damage, storm damage, and losing tons and tons of seed to squirrels, I invested into a quality bird feeder and I haven’t regretted it. Not only do I ultimately save money by buying less feed, I have far less aggravation and far more pleasure, watching and photographing my yard birds as they chow down. I have a Squirrel Buster plus and love it. I don’t mind a few seeds falling to the ground for the squirrels and other ground feeders to eat. The important point is that this feeder prevents the squirrels from monopolizing the feeder and cleaning it out of feed! Another great feature if this feeder in my area is that it excludes the White -winged doves which are as greedy or greedier than the squirrels here in Houston! I feed expensive safflower seeds to discourage House Sparrows as I am a Purple Martin landlord and the House Sparrows in my area have learned to feed on Black oil sunflower. The White -winged doves were emptying my feeders daily until I got the Squirrel Buster Plus, now I can fill it and it lasts all week with only desired birds (Cardinals, finches, woodpeckers, Carolina Wrens) feeding from it and they love it! I highly recommend this feeder! I have the Mini and love it. The squirrels have given up for the most part! I haven’t seen one make an attempt in weeks! It is pretty funny watching their failed attempts considering they trashed my last feeder. Revenge is sweet! I live in NJ and get tons of chickadees, tufted titmice, nuthatches, downy woodpeckers, goldfinch, chipping sparrows, and house finches. The local female cardinal will occasionally go on the feeder but the male is too large to perch on there comfortably. Lol….pretty inventive feeder.. but i am pretty certain the crafty squirrel will eventully crack the code…so to speak! I have the Mini Brome Squirrel Buster and love it so much due to the ease of cleaning, quick refill and seed savings that I will buy the Classic and others to round out my backyard. The squirrels here destroyed 2 of these feeders very very quickly. They took them apart piece by piece. Waste of money.